The 40th Anniversary of the IRONMAN World Championship is shaping up to be an epic showdown for the pro field. If the IRONMAN 70.3 World Championship was any indication of the level of athleticism, we may be in for more record-setting performances for both the men’s and women’s race this year. Kona is a notoriously difficult course, though last year we saw multiple male pros obliterate the long-standing 2006 bike record of Normann Stadler. The female pros and age groupers had a more typical hot, windy day. This year we are doing more in-depth weather analysis to fine-tune our analysis leading right up to race morning. Last year’s race featured pristine weather conditions. The sky was slightly overcast and the strong prevailing winds never materialized for the pro men’s race. While we don’t expect this year to be as conducive to record bike splits, that actually plays out better for the stronger cyclists hoping to gap the stronger runners for the overall podium. Over the last couple of days, we have seen typical wind conditions for the island. As of today we are expecting those to hold up, but here on the big island, things can change rapidly! Kona features some unique microclimates that cause the wind direction and intensity to change throughout the day. As such, the race day weather dynamics can change drastically based on start time; the Pro Men tend to experience the most favorable conditions while the age-groupers get to face the brunt of the famous Kona winds. 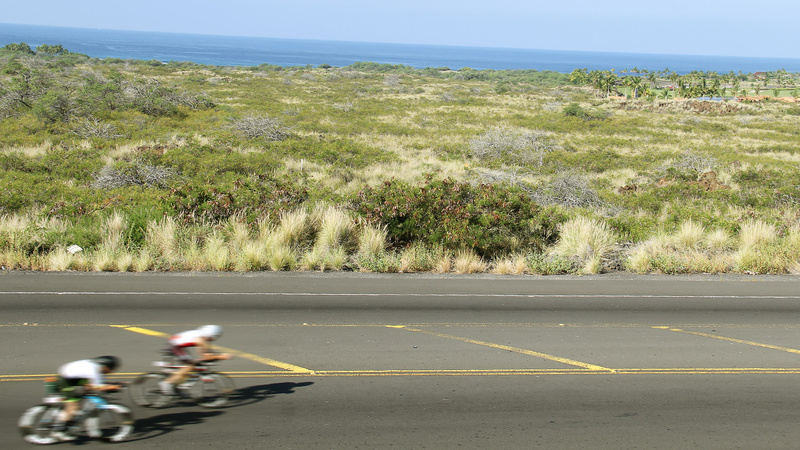 Typically early in the morning, athletes experience a light headwind as they head out on the Queen K highway. 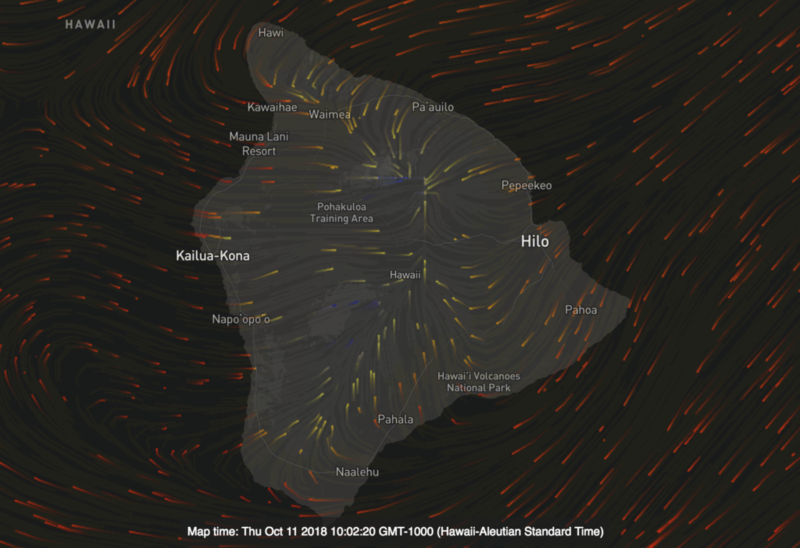 As they approach the Waikoloa, prevailing northeast winds are funneled through the two mountain ranges of Hawi and Mauna Kea. On the way out, these winds are usually lighter—but as athletes approach the climb to the turnaround at Hawi, the wind intensity picks up significantly. After the turnaround, there is a brief period of tailwind but any advantage here is minimized by the descent. The wind will intensify throughout the day, so the light crosswinds experienced on the way out will feel significantly stronger on the way back to Waikoloa. Between the pro men’s and age group race, the winds wrap around the island and actually circle back. So on the way back to transition, age groupers can experience a headwind heading out and a cross headwind coming back, while the pro men can sometimes “beat the wind” back into town. With so much talk about the wind we can’t overlook the heat and humidity. Athletes will hope that the clouds we’ve seen so far this week will hang around for Saturday, and some would actually welcome rain on the run. We expect temperatures in the upper 80s and humidity hovering at 70 percent. With no shade on most of the course, athletes are completely exposed. If they have not accounted for this direct sun and humidity in their race and nutrition planning, it could make for a very long day! Daniela Ryf has dominated the field once again this year and will be looking to add to her legacy as arguably one of the greatest endurance athletes of all time. If Ryf should falter or have an off day, Sarah Crowley, Lucy Charles, Anne Haug, Heather Jackson and a host of others all have a legitimate chance to take the top spot. And Mirinda Carfrae should never be overlooked. Not only is she a defending champion and one of the all-time greatest runners (male or female) in the sport, but she’s especially good in the heat and humidity. Lucy Charles is an amazing swimmer and should lead the race out of the water with Lauren Brandon not far behind. In the test swim race earlier in the week, Charles was on the toes of Josh Amberger, swimming a low 47-minute, so we could see swim records fall. Charles and Brandon would do well to work together early in the bike to try to keep Ryf at a distance. Last year Sarah Crowley was able to hold Ryf at bay until late in the bike, but this year we expect Ryf to try to make a statement and leave no doubt going for her fourth championship in a row. On the run, it will be hard for anyone to hang with Ryf, other than maybe Mirinda Carfrae who might lose a bit too much time on the bike. The battle for the remaining female podium spots is wide open, and as we have seen countless times at Kona, anything can happen. On the men’s side, the injury to Jan Frodeno has opened the door wide open with no clear favorite to take his place. Lionel Sanders will be eyeing the top spot after a close second last year, Patrick Lange will hope to run down the field again, and Javier Gomez might be the best bet to break the recent German stranglehold at the top of the podium after a hard fought third at the IRONMAN 70.3 World Championship. Major tactics will be on display with more über bikers in the field (Andrew “Starkey” Starykowicz, Cameron Wurf, Sanders, Sebastian Kienle, Amberger, etc.) and less-than-ideal wind conditions compared to those experienced during last year’s record-breaking bike day. Last year, Amberger was first out of the water and will surely be gunning for another record-breaking time with Gomez trying to hang on. Learning from his mistake, Amberger most likely won’t try to lead the pack up to Hawi—all of the front pack pros were happy to sit in and take advantage of the headwind draft effect behind him all the way to the turnaround last year. The strong cyclists will try to put major time gaps into Lange, Gomez, David McNamee and Matt Hanson to prevent a repeat of last year’s come-from-behind win. 2018, maybe more than any other year, looks set up to be a showdown between the elite cyclists and fastest runners in the sport, which could be great for Sebastian Kienle and Lionel Sanders. Sanders rode around a 305-watt average last year for a 4:14 (file) whereas Wurf has said he averaged 310 on his way to the new bike record. This year Starkey puts a new wrinkle into the mix, having stated he will be gunning it from the beginning. To go 4:10 he will need 420 watts. Amberger will be happy to try to hang on to Starkey, and with the slight draft effect, he would still need 305 watts to try to keep contact. Starkey should be able to keep the lead heading into T2 and maybe even extend it a bit unless Wurf decides he wants to try to bridge the gap. Lionel and Kienle will be happy to play it a bit safer and stay with the main pack after bridging the swim gap. It’s likely they’ll make their move after the turnaround, heading back into town. As for the strong runners, Gomez and Lange will want to keep the group together as long as possible. Last year Lange was able to minimize his time losses, but if the weather conditions are more typical, the time gaps can grow quickly. This year the run course has changed a bit, and more of the run is out in the lava fields on the Queen K. On the surface this seems to benefit Lange and Gomez, who have shown they can run very well in the heat, however Sanders has learned quite a lot from his second place finish last year, and came to the island very early this year to acclimate to the conditions. Sanders has also mentioned that he is paying greater attention to pacing on the run and adjusting efforts based on the undulations of the course. A mistake we see across both professionals and amateur athletes is going out too hard on the run. Sanders started the run last year at a 2:42 marathon pace, but had he dialed it back just to 2:45, that could have made the difference in the win. 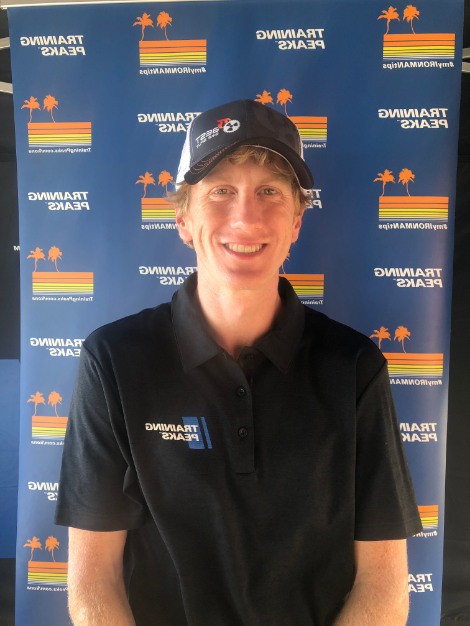 Ultimately, it is the IRONMAN World Championship, so all of the athletes are of the highest caliber and there are too many to mention who have a shot at the podium on both the men’s and women’s side. We hesitate to pick a winner but are excited to cheer on all the athletes and watch the race play out. To follow along with our bike predictions and see how you could do on the famous Kona bike course, check out the Best Bike Split Kona 2018 Prediction page.